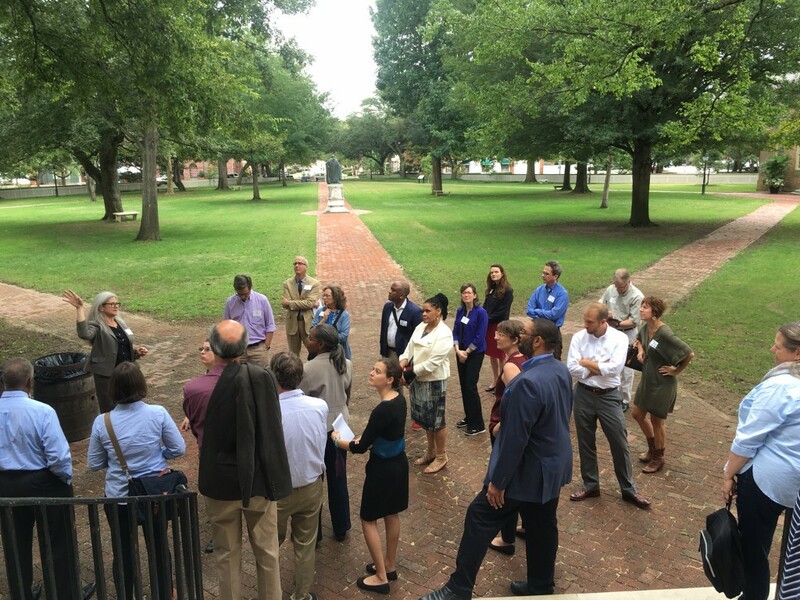 Universities Studying Slavery (USS) met Friday, September 30 and Saturday, October 1 at the College of William and Mary. Professor Jody Allen and her Lemon Project team hosted the consortium. In addition to the University of Virginia and the College of William and Mary, attendees at the meeting represented quite a few other schools: the University of Georgia, Washington & Lee University, Hollins University, Georgetown University, Virginia Military Institute, The University of the South–Sewanee, Clemson University, the University of North Carolina, George Washington University, and the University of Mississippi. The meeting kicked off on Friday in the historic Wren Building’s Great Hall with a wide-ranging discussion of the many challenges institutions face as they embark on projects involving research, public acknowledgement and memorialization, and even reconciliation and repair. 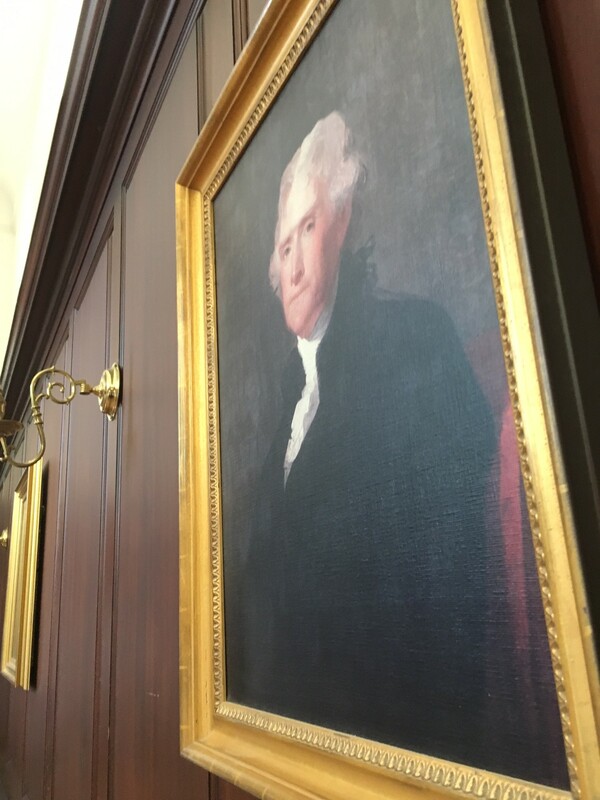 Both a portrait and a bust of Thomas Jefferson gazed down on the assembled group (we hope he was listening). • How to approach the conversation about slavery on campus at a large southern public university. • How does a working group or commission achieve effective outreach to the community? How do you find allies in the community? How to achieve quality alumni engagement? • How might an institution, despite often fraught historical relationship with the community it is embedded in, connect with or “find” descendant communities? • How to move beyond slavery and publicly acknowledge the racist (and often persisting) legacies of slavery? • How does a working group or commission convey to the institutional community and the broader public that this history matters? How do we explain what we are doing? • While this work is important, how can it change institutional practices regarding racism and diversity? • How do we educate ourselves (and our communities) about race? How do we create new ways of seeing the past and the present? • Defining terminology: outreach, diversity, community. • Creating a list of guiding principles or best practices for working groups tackling slavery and its legacies. 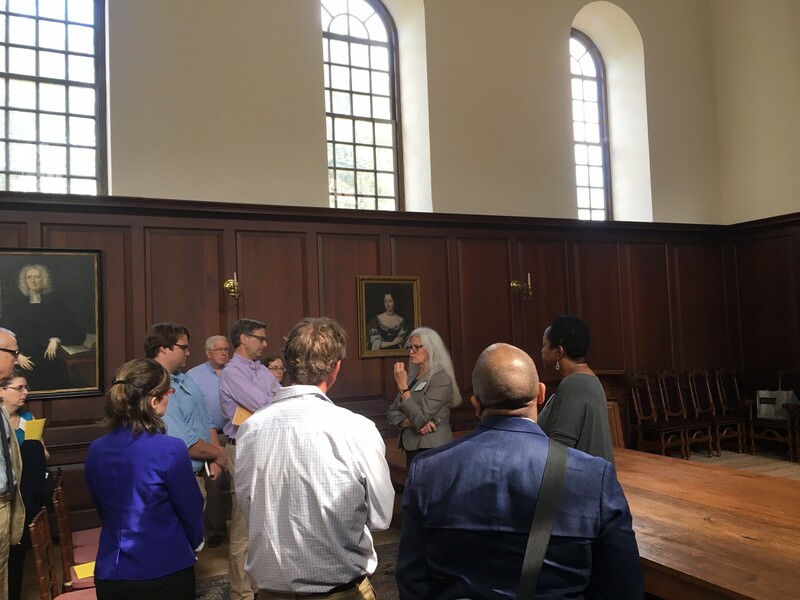 The group then took a tour of the campus at William & Mary led by professor Susan Kern, the Executive Director of the Historic Campus. 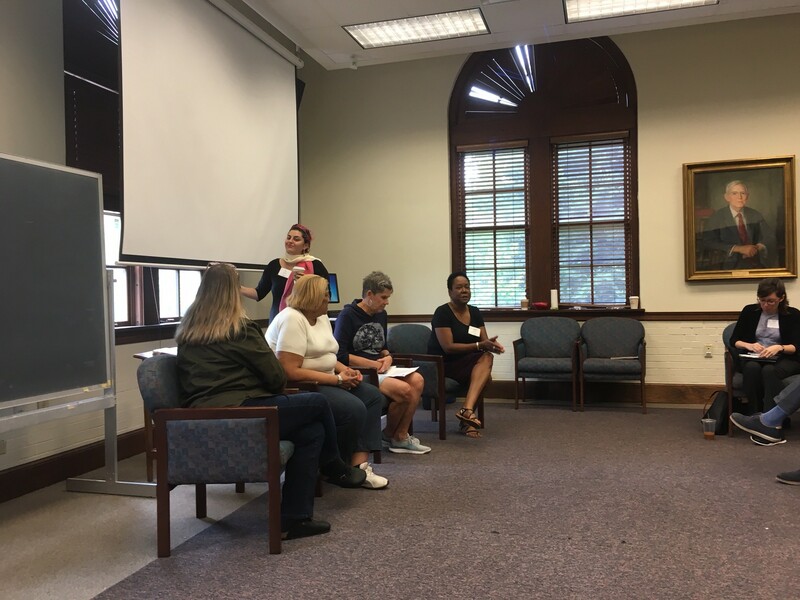 The group’s thought-provoking conversation continued in the afternoon with updates from Rhondda Thomas at Clemson University, James Benton of Georgetown University, Julie Campbell of Washington & Lee University, and Anne Twitty of the University of Mississippi. 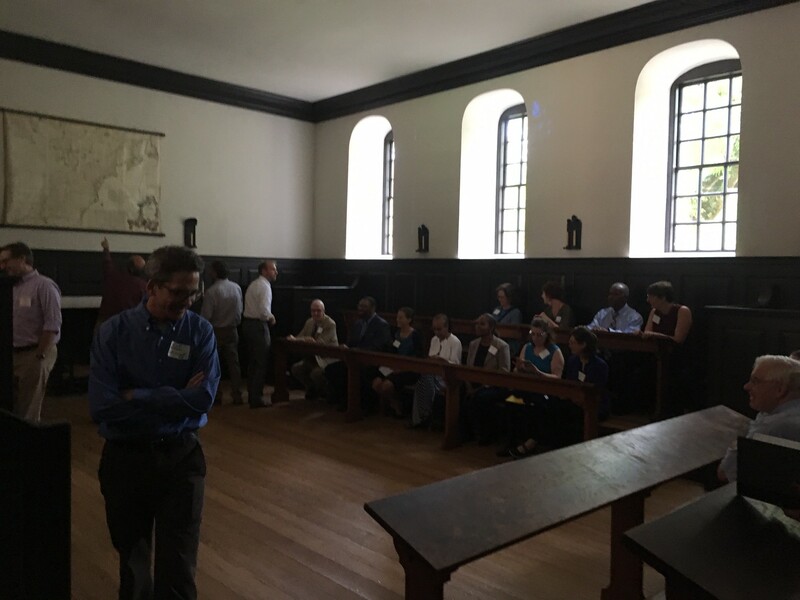 On Saturday, everyone reconvened in the morning at the history department in James Blair Hall. 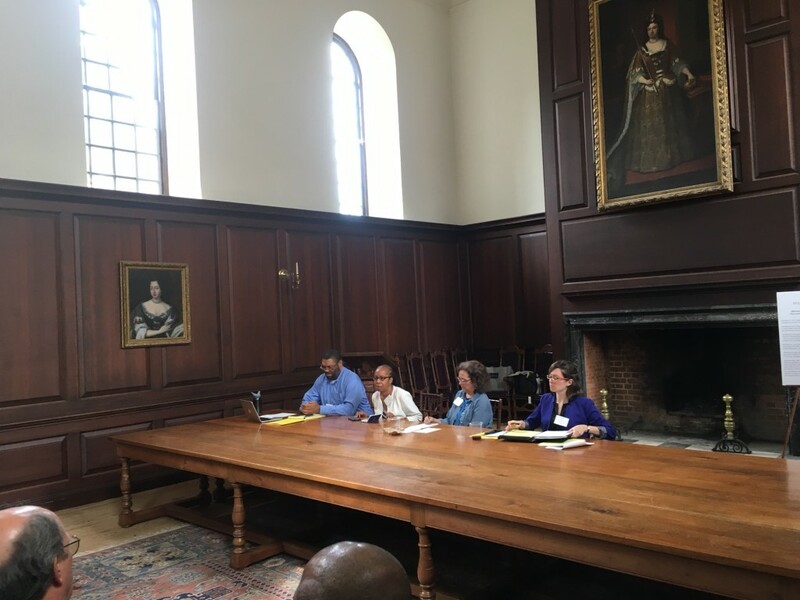 The first event focused on archaeology at Colonial Williamsburg and what it can tell us about the enslaved past at the College of William and Mary. Colonial Williamsburg Archaeologist Mark Kostro shared with the group the complicated history of the archaeological investigation of the Bray School site and buildings. The consortium meeting wrapped up mid-day with a community engagement panel that focused not on the institutions themselves, but members of the community talking about their own struggles with community engagement and offering advice to schools about both how to approach the community and how to talk about institutional histories of slavery and racism in productive ways. 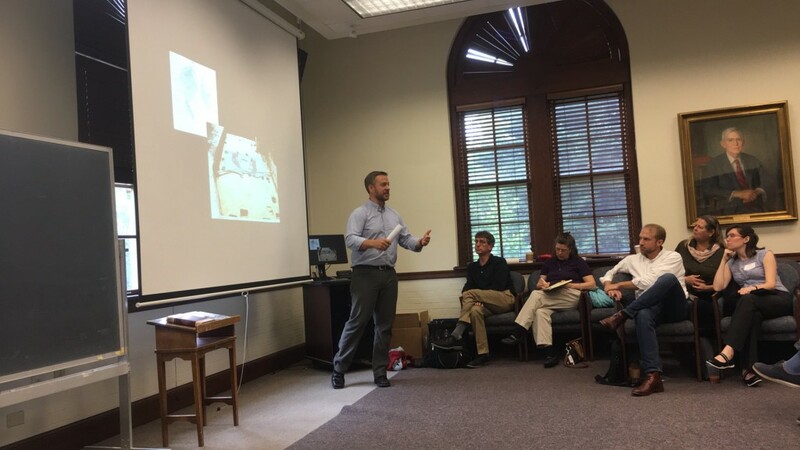 Thanks again to Jody Allen, the Lemon Project team, the College of William and Mary, and Colonial Williamsburg for a fine meeting. Universities Studying Slavery will meet again in spring 2017–we anticipate that this meeting will be held at the University of Virginia (details to follow later this fall).